FRONT ROYAL, VA — When you're one of the richest members of Congress and you represent San Francisco, the real world can seem as distant as the dark side of the moon. So it figures that House Minority Leader Nancy Pelosi was awestruck when Republicans had the temerity successfully to upend two of her most cherished political projects — a U.S. war with Syria and the congressional funding of Obamacare. "I haven't seen anything like it. I haven't seen anything like it," she marveled. And yet, we've seen plenty of things like it. The Rubble recalls then-Speaker Pelosi's retort when she forced the House to vote on Obamacare before members had read it: "We have to pass the bill so that you can find out what is in it," she helpfully explained. ...[a] permanent affliction ... plagues the Pelosi's of the world. They suffer from a constellation of blind spots that serve to conceal from them the better part of reality. Well, so goes "leadership" in Washington. 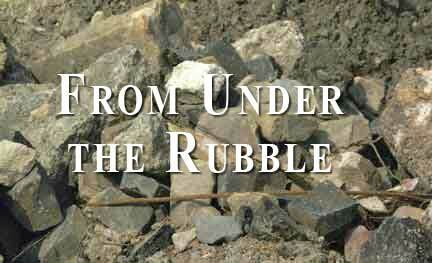 But what intrigues the Rubble is the permanent affliction that plagues the Pelosi's of the world. They suffer from a constellation of blind spots that serve to conceal from them the better part of reality. The Thracian Maid laughed at Thales of Milet, the ancient Greek philosopher, when he fell into a ditch while walking with his eyes on the heavens. But Thales was seeking the truth; the abyss of ignorance into which Obama, Pelosi and Co. have plunged the country is hardly a laughing matter. But [Nancy Pelosi's] vision of Obama dispenses him from the limits that have burdened his predecessors — "private feelings" like God, the Common Good, the rule of law, and individual liberty. Ms. Pelosi is dismayed that some Republicans have only scorn for the disasters that she and Obama have wrought. Again, she helpfully explains: "You know why it is," she whines on a leftist website: "He's brilliant … he thinks in a strategic way in how to get something done … and he's completely eloquent." Moreover, she coos, he is "open, practically apolitical, certainly nonpartisan." The rusty blade of this dull defiance anesthetizes any prospect of intelligible reply. And yet, the nature of an inquiring mind demands that it seek understanding. That prospect was admittedly dim, until the Rubble came across a passage in Through The Eye of The Needle, the masterful study of wealth and charity in the late Roman Empire by Princeton historian Peter Brown. Let each man question himself regarding his soul, to learn to hate in it a private feeling … and to love in it that communion and society of which it is said They had but one soul and one heart outstretched to God (Acts 4 :32). So, indeed, is your very soul not your own; it is also that of all your brothers, whose souls are yours, or rather whose souls combined with yours are no longer souls, but a single soul, the One Soul of Christ. In Gethsemane, as in Augustine's community, all "private feelings" are to be left forever beyond the gate. Moreover, the monastic rule requires of all professed monks the vows of Poverty, Chastity, and Obedience. As one dear friend there told me forty years ago, "I grew up poor, so poverty has never been a problem for me. Neither has chastity, thank God. "I thank God on my knees every day that I am still here." In the Trappist monastery, Father Abbot rules. However, he trembles with humility, aware that he is responsible to God for his every action. He must order each decision to the ultimate goal of the salvation of the souls under his care. For his part, the monk obeys cheerfully, since he knows that Father Abbot's rule is God's will for him, down to the tiniest detail of his life. Now, consider: Nancy Pelosi's Obama is a brilliant, eloquent, ultimately superior being, apolitical, above partisanship, caring only for what is best for those under his care. She cannot understand why everyone does not see him as she professes to. But her vision of Obama dispenses him from the limits that have burdened his predecessors — "private feelings" like God, the Common Good, the rule of law, and individual liberty. Moreover, as our National Abbot, Obama does not tremble, like Jefferson, "reflecting that God is just." For him, the sense of duty that motivated Jefferson and Father Abbot is worlds away. Because of his superior nature, Obama is responsible to no one. The country no longer needs to fret about the "Laws of Nature and of Nature's God" or the Constitution. Things are simpler now: his brilliant word is iron law. Like his fellow monks, Father Abbot takes a vow of poverty. But our National Abbot lives in luxury while he demands poverty of the rest of us. Only his cronies can dodge the bullet. Like Augustine, Obama calls on us to hate our selfish "private feelings," with our hearts and souls stretched out — not to God, this time around, but to his eloquent self. A curious aside: earlier presidents have not branded their programs with their name as this one has: Obamaphone, Obamacare. Obama draws his authority not from the God of Augustine but the Sovereign of Rousseau, the intellectual godfather of totalitarianism. The Sovereign imposes his superior will (volonté générale) on all his subjects. Those who refuse to shed their selfish "private will" (volonté de tous) must be "forced to be free." From the NSA to the TSA, our loving National Abbot holds our very lives in the palm of his hand. Inverting further the Christian metaphysic, Obama consecrates his private feelings and proclaims them as public rules. He will "spread the money around," stealing, spending, and extending poverty throughout the realm when the money runs out, bringing us all on our knees. That's right where he wants us. Only then will we "thank him on our knees every day," as we are reduced to a "single soul," with our arms outstretched towards the National Provider. But first we must learn obedience. And in Obama's Monastery, as in Gethsemane, that demands a lifetime of self-denial and sacrifice. So much for poverty and obedience. What about that vow of chastity? Here, Obama subverts nature once more: in Obama's Monastery, perversion is worshipped. Those who insist on obeying the Laws of Nature and of Nature's God must be "forced to be free." This attack on the Natural Law is not merely a sop to the prurient: it is a metaphysical necessity. The Natural Law is a golden thread that gently binds the social fabric. Remove it, and freedom disappears, while society collapses. Thus, in Obama's Monastery the rule of law is first ignored, then destroyed, all with the ironclad authority of the National Abbot. "I chastise my body and bring it into subjection," says Saint Paul (I Cor. IX, 27). "Here, let me do it for you," says our National Abbot. When I was a roadhouse entertainer, I heard the tearful account of a battered woman whose boyfriend often beat her. "He's got such high standards," she sighed, rubbing her bruises; "and sometimes I just don't live up to them." In Obama's Monastery, we must live up to Obama's high standards. Well, like the misbehaving monk assigned a penitential task by Father Abbot, Obama's monastic rule requires that we welcome the government beating. After all, it's for our own good. It gives a new meaning to "SWAT." Admittedly, the prayerful pursuit of perfection in a monastery is hardly a perfect metaphor for a drivel-driven spin machine oozing self-serving treacle masquerading as dialogue. But what about Nancy Pelosi? Does she really believe her gushing blather? Does she "thank God every day" that she has to get up in the morning and peddle that pathetic palaver to the masses one more time? In her hardened heart of hearts, this Catholic grandmother might still remember that the Hound of Heaven is patiently curled up outside her door. But alas, that door opens only from the inside. In contrast, Big Brother can kick yours down whenever he pleases. And so can our National Abbot.